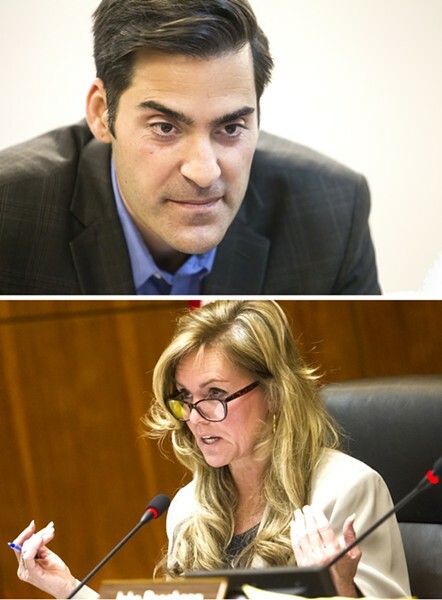 If you are looking to get elected to office in SLO County this June, it's going to cost you. A lot. Recently released campaign finance reports showed that candidates in races for county-level offices in the June 5 primary raised a combined total of more than $1.5 million in the first four months of 2018. That amount includes cash donations, loans, and non-monetary contributions to campaigns for county assessor, district attorney, county sheriff, two county supervisor races, and seven local judicial races. CASH Candidates running for office in SLO County raised more than $1.5 million in the first four months of 2018. SLO County 4th District supervisor candidates Jimmy Paulding (top) and Lynn Compton (bottom) raised more than $398,000 in that period as they prepare to face off in the June primary. The combined war chests of the various 2018 campaigns dwarfed those raised in the first months of the 2014 primary elections, when many of those same county offices were last up for grabs, by more than $1.2 million, an increase of about 80 percent. The race for SLO County 4th District supervisor tops the list, with candidates Lynn Compton and Jimmy Paulding raising a combined total of $398,944 so far in 2018. The two candidates running for SLO County Sheriff reported $381,444 between their two campaigns. In 2014, incumbent Sheriff Ian Parkinson ran unopposed for re-election and raised and spent less than $1,000. Parkinson's campaign raised $253,965 in 2018 thus far. The bulk of that amount came from large donations made after March 16, when the SLO Tribune released video footage of the death of SLO County Jail inmate Andrew Holland. Parkinson's opponent, Greg Clayton, raised $127,479 in campaign funds. Clayton received a $25,000 donation from Holland's father, Carty, in February, and another $10,000 from the Holland Family Alliance for Humane Mental Health and Correctional Reform that same month. In the race for SLO County District Attorney, incumbent Dan Dow and challenger Judge Mike Cummins raised a combined total of $307,248 since January, more than three times what was raised in the same reporting period in 2014, when the DA's race had three candidates. SLO County Democratic Party Chair Rosemary Wrenn said the large amounts of money raised by the campaigns were possibly the result of a growing partisan divide at the local and national levels. "There's been such a polarization of opinions, and each side has been energized," she said. SLO County Republican Chair Randall Jordan pointed to the involvement of the SLO County Progressives as one reason why the county races were getting more contentious and expensive.